Here we go everyone…shifting into high holiday gear! It’s a shoppingwrappingdecorating blur, and if you are the chef, or even part of the kitchen crew, it’s time to finally finalize that festive holiday dinner menu! Mine is pretty much locked down, but I have to say that the hardest part of the whole thing for me is always figuring out the appetizers. You want something that is going to be just the right amount of scrumptious, but also just the right amount so that they won’t get all filled up before you roll out the main course. And easy. You are about to spend enough time in the kitchen on everything else that you don’t want your nibbles to take more than a few minutes to whip up. So let’s whip up some whipped feta cheese dip! Speaking of easy, I have figured out a 100% percent guaranteed, 100% easy way to get your tree decorated. 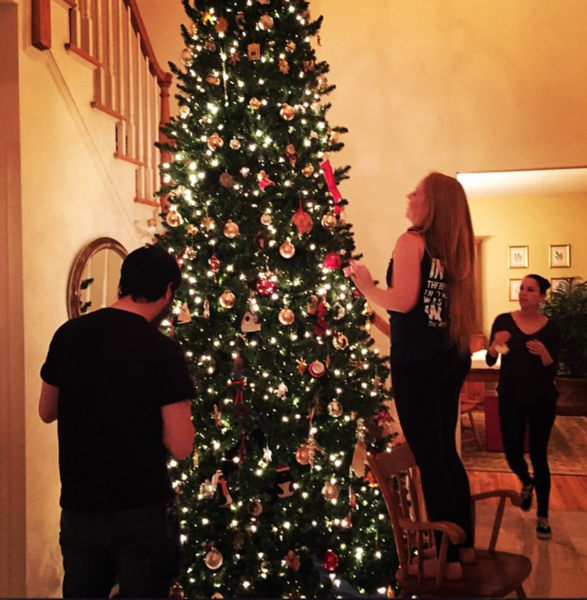 Step One: Put up the tree with only lights. Step Two: Say to your home-from-college daughter that it actually looks very pretty with just lights, and maybe we’ll leave it minimalist this year with no ornaments. Step Three: Try not to burst into laughter at the expression on her face. Stand firm about the whole only lights thing. Step Four: Settle into your comfy chair while she rallies all her friends to decorate the tree. 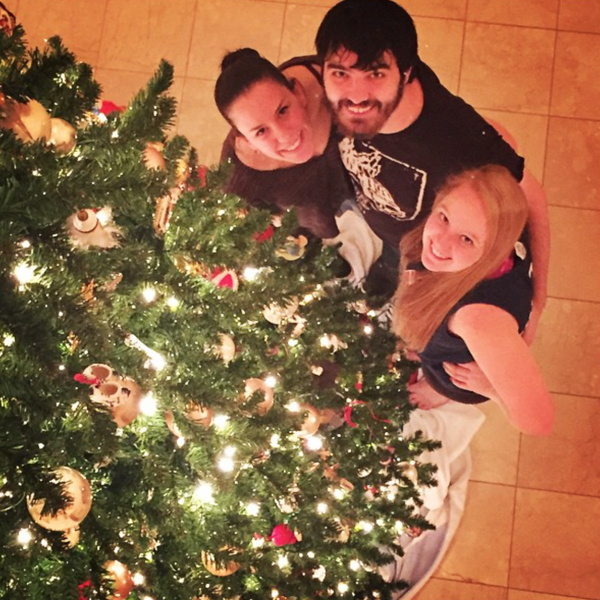 Step Five: Realize that she was on to you the whole time, and that the college gang had a jolly old time eating Chinese food and listening to Pentatonix Christmas carols while they decorated. Aren’t they adorable? When they were done they watched the Grinch, and it was just like the old days. I’ve decided none of them are allowed to graduate and become fully functional adults. They all have to move into my guest rooms and stay forever. Meanwhile back at the dip, here’s all you do: put a nice hunk of feta cheese into your food processor with some milk, some chopped dill (and you are not a dill person, sub in parsley or mint or thyme or any combo thereof) and process away until it is all creamy and combine. Taste and season it up with salt and pepper. Put it in a pretty bowl, drizzle on a little olive oil and shake on some nutmeg, and voila! Easy, delicious and done in 5 minutes. Maybe I can get the college kids to make it? Since they are staying and all. 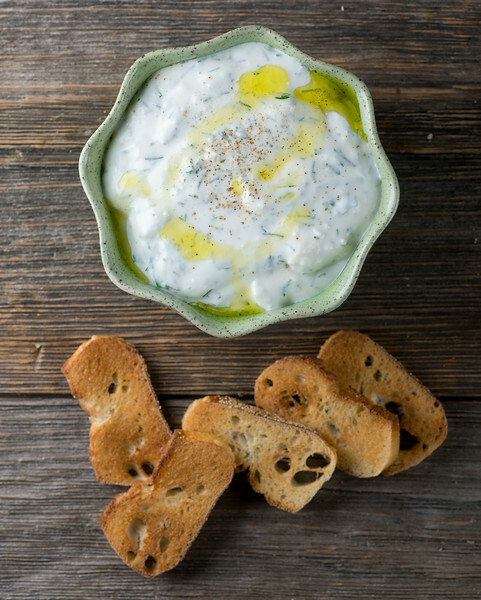 A quick and delicious creamy feta cheese and herb dip that you can whip up in less than 5 minutes! 1/2 cup chopped dill, mint, parsley, thyme or any combo thereof! Place feta and herbs in food processor. Turn on the processor and slowly pour the milk into the feeding tube until the dip is creamy. Depending on the consistency of your cheese you make need more or less of it – stop the processor and sample as you go! Season to taste with salt and pepper. Scrape into a pretty bowl, drizzle with olive oil, dust with nutty and serve with crackers or toasted baguette slices. Such a wonderful appetizer this week! Yum. Thanks Robyn! Happy, merry, delicious holidays! Looks great as usual Kate! Having New Years guests and think I will save this for then! Have a Merry, Merry and enjoy your collegiate crew and your family..
What is going on with your site? I keep getting ads for Checkmate and a car co. that are almost impossible to delete making it almost impossible to read your posts. Very frustrating g as you are one of my favorite sites. Oh no! I will email you separately to get more info. Thanks for letting me know. Hmmm I like the method to your madness. :P And I LOVE the feta dip! I very well might eat the majority of a bowl myself.